One of the hardest lessons to learn in travel hacking is knowing when to let go of a trip, particularly when it is ‘free’. Recently, we took another gamble on Vegas. For new readers (or those who didn’t keep up with this) when we ‘Vegas’ we don’t gamble in the same way that others do. To the casual observer, gambling means taking some money, putting it in a slot machine or table game, and hoping for the best (regardless of card counting ability). We approach the gamble very differently. My upside is not connected to winning or losing money, but whether the event of gambling triggers enough Comp to come out ahead of either financial result. If I lose $5000 but ‘win’ $50K in comp, I’ll take it. For those who MS, compare this to the guarantee of paying ~$7 to buy and liquidate a gift card that earns you $25 vs paying ~$0 to Kiva but knowing that there will be an element of randomness to the fee you pay. Our latest gamble didn’t pay off. We were offered a free cruise on RCCL, but could get no further details. It could be a 7 night on the biggest, sparkliest ship in a suite (spoiler alert, it wasn’t), or 2 nights cruise to nowhere on their oldest tug boat. We wouldn’t know until we went to the booth to pick up the certificate. We rolled the dice. We stacked the odds in our favor by controlling the narrative of the trip. Rather than it being about going to Vegas to pick up the Certificate, it was about a nice vacation that incidentally involved us walking past this booth, and maybe hitting the Jackpot. We used points for flights (outbound in First Class because we wanted to control the flow of the vacation) the room was comped, and we had several hundred in free money from MGM and Caesars to spend on food. In the end, because we focused on spending the free money wisely, and willingly spent real money outside of those chains to experience things that mattered, the trip turned out really well. This offset the loss on the certificate. (the cabotage issue would be that ‘short hops’ outside of the US require you to re-enter the US at the same point you departed, so a nonstop to JFK from NAS might be an issue.. Cuba might address that, but Cuba also isn’t the best Country to be leaning on to help clear up US immigration concerns… oh, and incidentally I’m currently exploring Naturalization, so that would be a factor). It was almost a great trip. 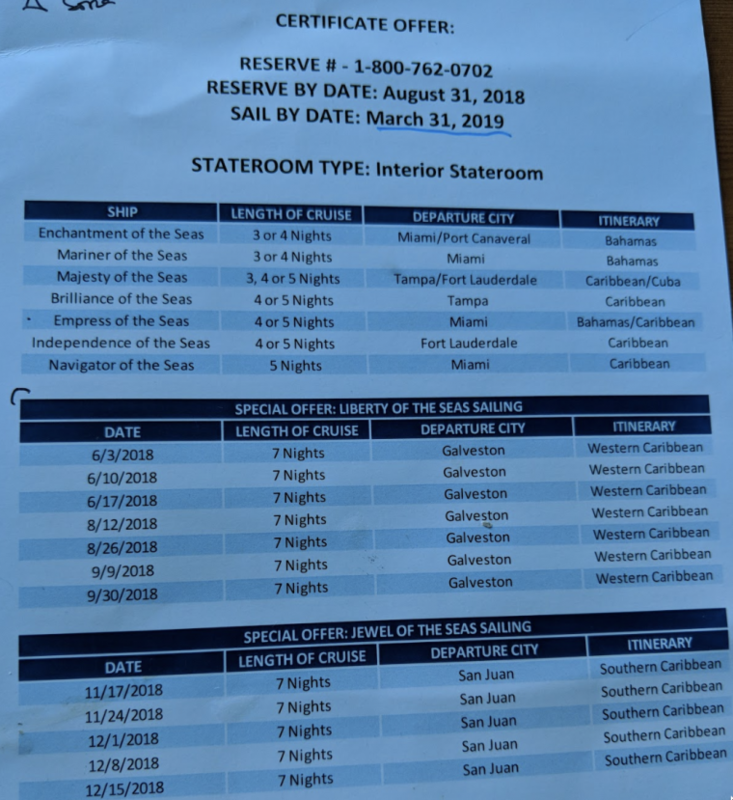 The cruise fare for two would be taxes and fees only, so around $230, but once you add in the 3rd guest, and the onboard gratuities, we would be around $800-900. Also, the ship wasn’t that sparkly. I might pay $800-900 to experience the Oasis Class, but for the older ships, I didn’t think it great value. I understand that to someone else, it would be great value, but the final piece for us was that we really want to see Cuba, so the alternative option of flying nonstop JFK>HAV and spending a few nights in Cuba seemed a lot more immersive. There was a lot of fluff and waste with the cruise, so despite it being a deal compared to paying full rate, it wasn’t a deal to us. If we’re going to a destination to see it, does the ‘free’ trip cover the bases, or is it only somewhat OK? Traveling even to somewhere close like Havana takes a fair amount of time (driving to/from airports+flights+whatnot) so it is important to us to visually walk through how the vacation would feel. Perhaps it would feel fine on a cruise in some cases, but in others, and when the price is already perhaps more than immersion, the ‘free’ option doesn’t fit. Demand/Load – we have other options. The cruise gig is now totally out of hand where we could book at least 8 cruises in the next 6 months to basically anywhere in the world. While it is hard to do, especially with a new line like RCCL, something has to give else we will just be on vacation permanently. If we had no other cruise options, I think we’d likely go for this one, but at some point, we had to say no. So.. we didn’t hit the jackpot in Vegas this time around, but we learned to say no to free. When doing so, we also agreed that we could risk losing Atlantis too, as it wasn’t a good time to travel right now. The next challenge for us is whether we can say no to the gamble. IE, if we are offered a similarly obscure ‘free cruise’ if we go to Vegas, will we decline unless they give us the details, or will we roll the dice again? Here’s some posts on what I’ve been doing on the gambling stuff, so you don’t have to search for it. For those following, our offers are now down to 3 nights in a room vs suite, and $50 in F&B, and I am now getting marketing from Circus Circus vs Aria Skysuites. Our trip to Vegas to pick up this Voucher is written up here: Storytelling through food. We spend $0 ‘gambling’ because actual casino gambling, no matter how savvy you think you are, is throwing away money. The post Learning when to let go of free appeared first on Saverocity Travel.